Pilgrims pray at the closed doors of Jerusalem's Church of the Holy Sepulchre on February 27. Israel suspended a controversial tax plan and property legislation today in response to the unprecedented Christian decision on Sunday to close the Church of the Holy Sepulchre in Jerusalem. Prime Minister Benjamin Netanyahu and Jerusalem Mayor Nir Barkat agreed to form a government committee to “formulate a solution” and negotiate with church officials. In response, the leaders of the Roman Catholic, Greek Orthodox, and Armenian clergy will reopen the church on Wednesday, reports the Associated Press. Barkat had stated that Jerusalem’s churches owed more than $180 million in taxes on church-owned commercial properties, and the municipality had frozen church accounts. Meanwhile, legislation advancing in the Knesset had threatened to complicate the churches’ ability to sell their properties. Now suspended, these actions were contrary to the historic agreement between churches and the various civil authorities which ruled Jerusalem, said Bishop Sani Azar. 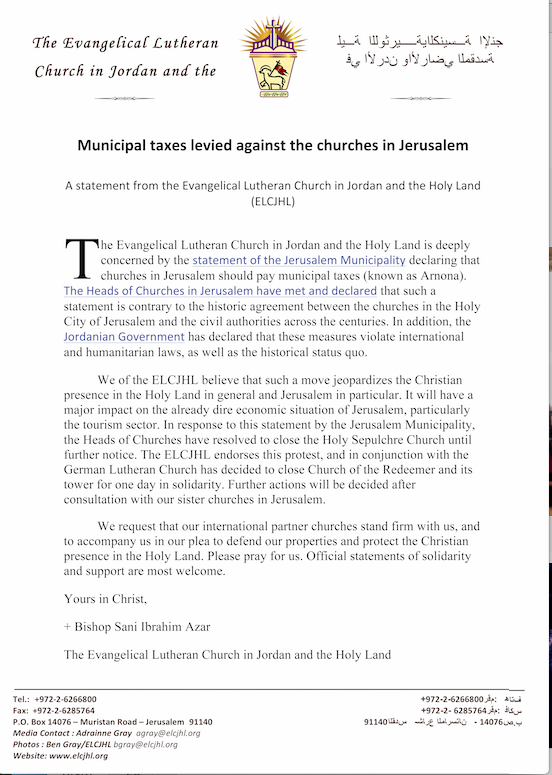 His Evangelical Lutheran Church in Jordan and the Holy Land closed its Church of the Redeemer for one day in solidarity, pending consultations with sister churches in Jerusalem. “All the churches are united, so this shows something is very wrong,” said Salim Munayer, head of the Musalaha reconciliation ministry in Jerusalem. Christian denominations have long competed for control of religious property in the Holy Land. One particular example rests in the “immovable ladder” outside a window in the Church of the Holy Sepulchre. Present since the 18th century, an agreement between the churches states that no property may be rearranged without the consent of all others. On Sunday, they all agreed to close the front door. Equally historic is the “status quo” agreement that Christians believe is threatened by Israeli actions, explained Munayer. Formulated by the Ottoman empire in 1757 and renewed after the Crimean War in the mid-19th century, the agreement achieved a tacit peace concerning the disputed holy sites of Christians, Muslims, and Jews. It was not perfect, said Munayer, but it was respected subsequently by British and Israeli authorities. The current tax and property issues are just one more in a series of Israeli administrative decisions that harm Christian interests, he said. CT has previously reported about the withdrawal of subsidies from Christian schools, and President Trump’s decision to recognize Jerusalem as the capital of Israel. Munayer believes Israel wants to impose its legal control over Jerusalem, including its churches, contrary to the inherited status quo. Traditionally this is just one of the difficult “final status” issues to be resolved in Israeli-Palestinian negotiations. Complicating the issue further is what Munayer believes is a popular Christian frustration with church leadership. Part of the current property legislation dispute involves church properties that have been sold. “There are so many layers, it is very complicated,” he said. “Politics and money have always been a part of Jerusalem, but the status quo was helpful and livable. Munayer’s Musalaha ministry aims at the reconciliation of Christians and Jews, and he laments the opening of another front of dispute. But the united action of the churches to close the Church of the Holy Sepulchre has at least temporarily addressed the pressing tax and property issues. “Israel is home to a flourishing Christian community and welcomes its Christian friends from all over the world,” stated Netanyahu’s office in announcing the suspension. UNESCO grants endangered status to Bethlehem's Church of the Nativity.